G.Skill has recently launched new Trident Z RGB memory kits, this time aimed at Intel X99 platforms, and following the RGB trend they give owners of high-end desktops an opportunity to customize the look of DRAM inside their machines. This is also the launch where the company introduces its first 16 GB memory modules with programmable LED lighting. 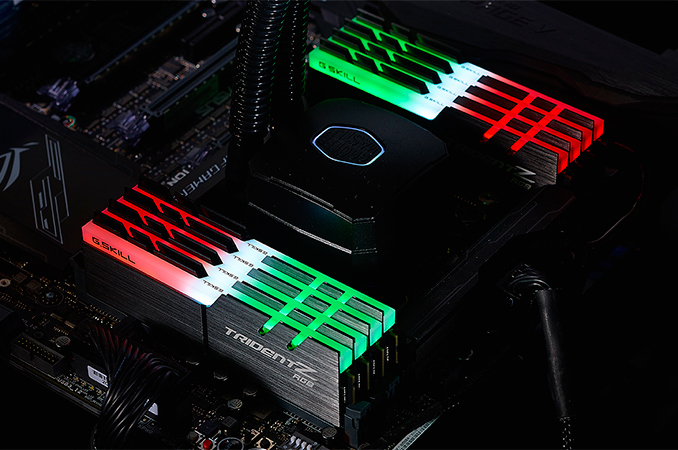 The Trident Z RGB memory modules feature programmable LED lightbars and can change their colors in accordance with user’s demands (G.Skill offers special software to customize lighting effects), providing the ability to modify the look of a PC on the fly. G.Skill first announced its Trident Z RGB memory modules in late 2016 and started to sell them early in 2017. Initially, G.Skill’s Trident Z RGB dual-channel kits were only focused on Intel’s Z270-based platforms and contained 8 GB DIMMs running at up to DDR4-3866 MT/s. Going forward, G.Skill will offer 16 GB Trident Z RGB modules in both dual-channel and quad-channel kits. Just like the Trident Z RGB 8 GB modules, the Trident Z RGB 16 GB DIMMs are based on Samsung’s 8 Gb B-die memory chips made using 20 nm process technology. The 16 GB modules will run at DDR4-2400 to DDR4-3866 with CL14-18 latencies at 1.2 V or 1.35 V, depending on the kit performance. 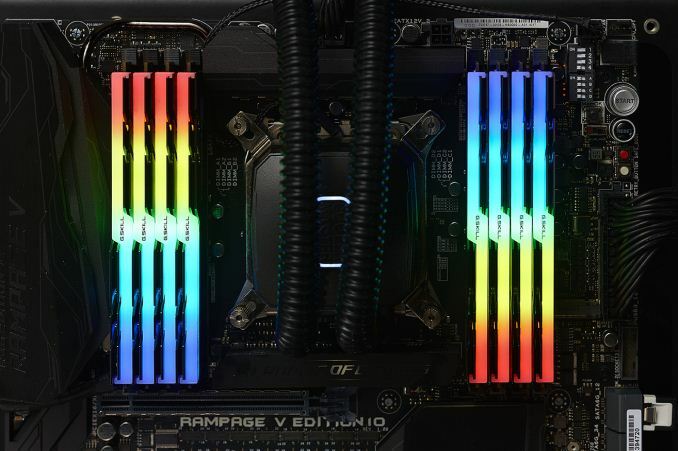 The Trident Z RGB fully support Intel’s XMP 2.0 as well. G.Skill’s fastest dual-channel Trident Z RGB 32 GB (2×16 GB) kit will run at 3866 MT/s with CL18 18-18-38 timings. RGB commands a premium, so while the company’s fastest DDR4 kits (rated for DDR4-4266) are not RGB, the new modules are still a very high data rate for 16 GB modules. As for the fastest quad-channel kits, G.Skill now offers the Trident Z RGB 64 GB (4×16 GB) rated to operate at 3600 MT/s with CL17 19-19-39 latency settings as well as the Trident Z RGB 128 GB (8×16 GB) DDR4-3333 kit with CL16 18-18-38 timings. While these kits are aimed at Intel systems, we would assume that qualification on Ryzen systems will be an ongoing process. G.Skill has just sent us a 2x8GB DDR4-3200 C14 kit of G.Skill FlareX (non-RGB) modules for our Ryzen testing, so it's clear that G.Skill (and others) will have AMD qualified kits in their roadmaps. Motherboard manufacturers typically have memory qualified validation lists on their websites for each motherboard, showing which modules have been confirmed to work. Initially it was hit and miss on DRAM qualification with the launch of Ryzen 7 due to timing, but most vendors are falling into place with appropriate BIOS updates. G.Skill traditionally does not announce MSRPs for its memory modules, due to the volatility of the DRAM ICs, but given the fact that DRAM pricing is generally increasing, expect the new Trident Z RGB kits to be priced at high levels. Moreover, since it is not easy to handpick 8 Gb chips for high-speed 16 GB DDR4 memory modules, expect the manufacturer to charge a premium for kits that use high-capacity DIMMs. As an example, right now G.Skill offers 32 GB (4×8 GB) DDR4-3600 and DDR4-3866 kits without RGB for $410 and $460, respectively.